I am Dulli Tengeler. I have been living at Birdsfoot Farm since 1991 with my husband Steve and our daughter Kira. Our son Seba is now grown and performs music in Boston. At Birdsfoot we live together as an intentional community, currently with six other adults. I am originally from Hamburg, Germany. After high school I had a formal two year farming apprenticeship in Germany and four years of farming college. As part of that college experience I interned at Birdsfoot Farm in 1990 and joined the community a year later. My first ten years here I worked at Birdsfoot with Doug Jones (founder) and other partners and interns in the veggie business where I learned the art of growing intensely and with low input and cover crops. The Birdsfoot Farm veggie business is structured as a partnership and I am looking for more partners. We hire 3-5 part-time and full-time workers during the season and work as a team. Working together as a group is rewarding and important to me as is living in community. After Kira was born I took some time off and just grew for the community and some wholesale. It was the chance to include CSA to the mix. I believe it is good to have several markets, retail and wholesale to minimize risks and be able to expand if more partners want to join in. We also sell to the Canton Farmers Market, The Potsdam Food Coop, Natures Storehouse and NCGC (North Country Grown Coop). The CSA is an important to me, because we have the most personal contact and appreciation for each other. Members commit and learn to eat in season and are part of the blessings and troubles of growing veggies. In our biweekly newsletters we share stories of the farm and explain how we grow and how to prepare the goodies. I believe in organic farming because I want to offer healthy food to my family and to you, because I want the soil to be healthy and long lasting and because our water, air and all are precious. 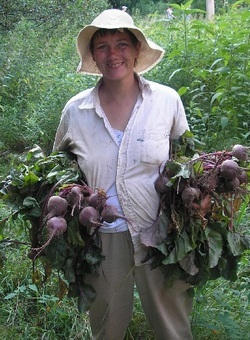 In 2012 we grew over 9 tons of veggies on 2.5 acres. To replenish the soil we do cover cropping with buckwheat, clovers and grains. We add manure to some of the fields and mulch crops adding organic matter to the soil. I recognize that we still “import” local manure and hay (seed free) and don’t have a closed circle yet. Our soils have 4.5-6% organic matter. I also love cows. Our cow Carol gives us creamy milk and we make our own butter, yogurt and a variety of cheeses. I like to watch independent movies and dance salsa. I have a full life in the Birdsfoot community.